20thCenturycollectables.co.uk: Current stock: Chandelier of Italian white glass hooks hung on a 4 tier white painted steel frame. This chandelier is also available with clear glass hooks hung on a stainless steel frame.Diameter 45cm. Length 130cm plus chain length to suit. We are a vintage Italian chandeliers specialist, run by Jan Southgate. Our stock, sourced directly from Italy, includes many classic mid 20th Century designs. These one-off chandeliers from the 1960s and 1970s make a beautiful addition to any room. 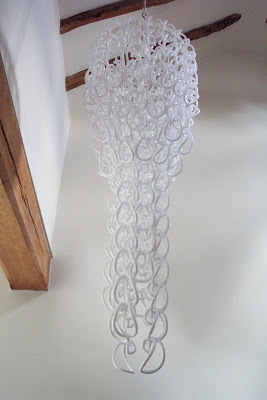 We are also developing a series of limited edition handmade contemporary chandeliers. Please call us on 01787 211450 or email jan@20thcenturycollectables.co.uk for more information. Current stock: Chandelier of Italian white glass hooks hung on a 4 tier white painted steel frame. This chandelier is also available with clear glass hooks hung on a stainless steel frame.Diameter 45cm. Length 130cm plus chain length to suit.